When I started hiking the Cascades and Olympics 25 years ago, the only hiking guides available around here were the “100 Hikes” series by Harvey Manning and Ira Spring. Published by Mountaineers Books, and used alongside Green Trails maps, they were the primary resource available to hikers. Today, a wealth of current and accurate trail information is available whether on a bookstore shelf or online. But there’s still room for a new favorite, and “Beer Hiking Pacific Northwest” might be it for me. I’ll admit – sometimes when my friends and I are researching hikes for a summer Saturday, we might base the decision partially on which brewery we want to visit for an apres-hike burger and beer. Ok, sure – sometimes we base our hike decision *solely* on which brewery we want to visit. You don’t have to twist my arm very hard for a hike around Mt Baker’s Chain Lakes Loop followed by pizza and ESB at North Fork Brewery. And sometimes, we avoid hiking at Sunrise on Mt Rainier specifically because there’s not a brewpub in Greenwater. 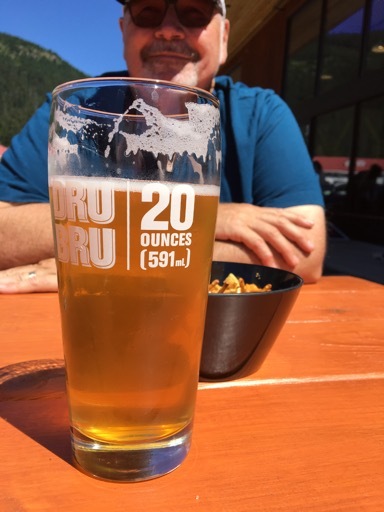 After hiking Gold Creek at Snoqualmie Pass last summer, Kendall enjoyed a post-hike beer on Dru Bru’s patio. This new book by local authors Rachel Wood and Brandon Fralic promises to open up my beer and hiking frontiers a little more this hiking season. The authors, who are also behind the blog beersatthebottom.com, have hand-picked 50 hikes in Washington, Oregon and British Columbia, and paired each with a beer from a local brewery. Usually the paired brewery is near the trailhead, like the Whistler Train Wreck hike paired with Function Junction’s Coast Mountain Brewing. Sometimes it’s a hiking-themed beer that’s a natural fit with the trail, like Mt Rainier’s Skyline Loop paired with Two Beers’ Wonderland Trail IPA. The first thing I noticed upon opening the book is that this is not a Mountaineers- or Sasquatch-published book. Published by Helvetiq from Switzerland and distributed in the U.S. by Sumner-based Toysmith, the shape and style of the book are different enough that it pops right from the get-go. Colorful graphics detail everything from the hike’s elevation gain to the beer’s bitterness. The layout is very organized and appealing, with each hike and brewery pairing receiving an even four pages of content including a graphics-based overview, a detailed hike description, driving directions, and a quick overview of the brewery. Each trail description has a full color photo, and which Green Trails map you should bring along – and you’ll need this because the map in the book is not as detailed as in the Mountaineer’s “100 Hikes” series. The description also notes which trail park pass you should bring. The trails are ranked by difficulty from walking (easy), to hiking (moderate), to mountain hiking (difficult), which is the case with this trail. They also include an estimated duration, plus the trail mileage and elevation gain. 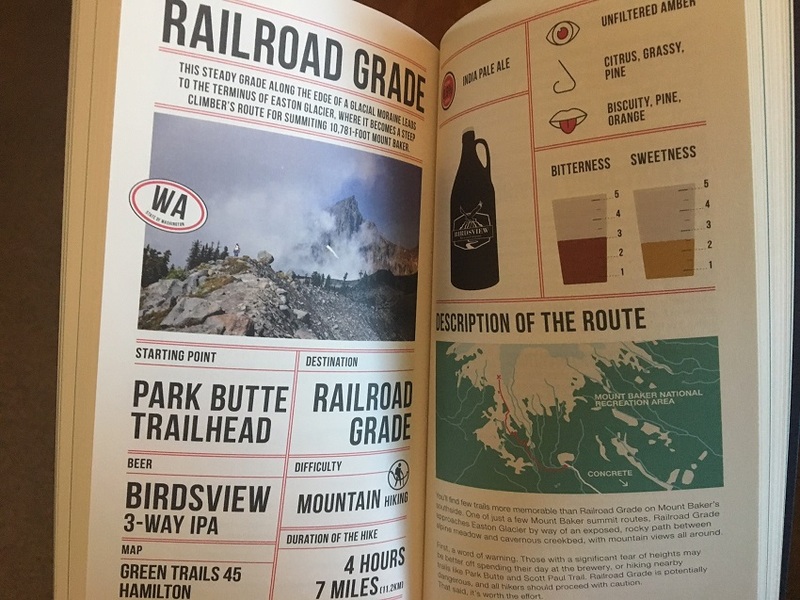 Before they even get into the detailed trail description, the authors wet your whistle with a brief, graphics-oriented beer recommendation. For example, it might be the Birdsview Brewing IPA, which they list as an unfiltered amber with a nose of citrus, grassy and pine, and flavors of bisquity, pine and orange. The beer is also ranked for bitterness and sweetness. The hiking trail itself is described in detail that paints the picture well. That includes not only things to look forward to, like “mountain views all around,” but also things to beware of, like that, “those with a significant fear of heights may be better off spending their day at the brewery, or hiking nearby trails like Park Butte and Scott Paul Trail.” The trail descriptions are detailed and descriptive enough, including potential side trails and handy turn-by-turn directions with mile markers noted. In addition to the trailhead directions and a description of the brewery taproom, the pairing also includes handy contact information for trail info, local accommodations and tourist info. Flipping through the book, you’ll find a variety of hikes from easy 1.4 mile walks to 8.4-mile mountain hikes. 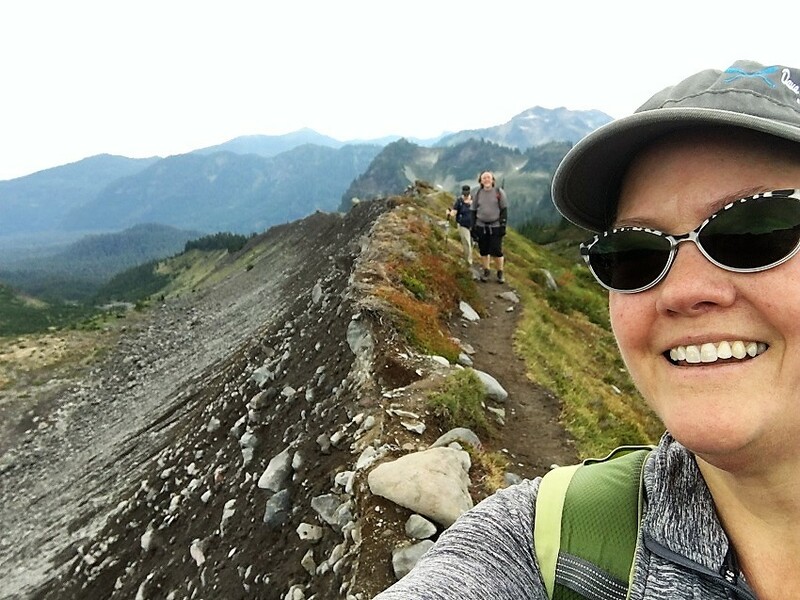 Some of the hikes are popular favorites, like Ebey’s Landing or Maple Pass Loop, but some of them are, thankfully, less well-known, even for an old-time hiker like me. I’ve already got my eye on a couple new hike-and-brewery pairings to try this year. Heck, I might even start this weekend. “Beer Hiking Pacific Northwest” will be available this spring at Bartell Drugs, REI, Amazon.com and other booksellers. 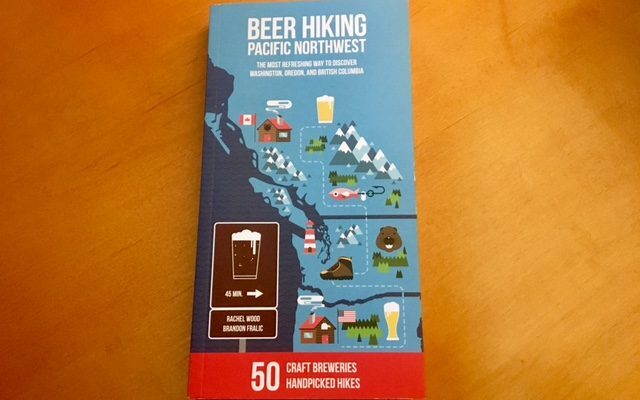 **Update** as of 4/25/18 “Beer Hiking Pacific Northwest” will hit the stores at Bartell Drugs. It should be out to all the stores within the week. Have you tried the Cole Street Brewery in Enumclaw for a post-hike pint of suds? They do a great job over there! There’s also terrific food at nearby Kelly’s Restaurant and Lounge, and epic pie at the Pie Goddess. Next time Sunrise at Mt. Rainier beckons can the apres hike food and beverages in Enumclaw tempt you? Yes I’ve been to Cole Street, and our regular stop in Enumclaw is The Mint. Best burgers! When/where can I buy this?! They’ll be in Bartell stores very soon and on sale 5/21 through 7/30.